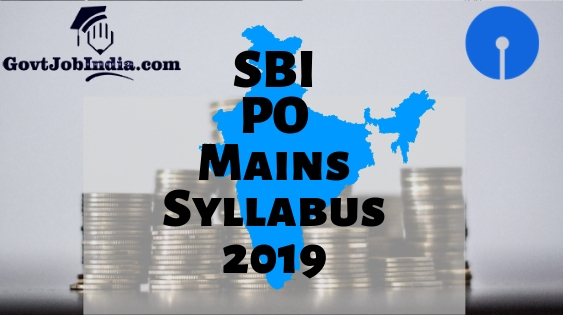 SBI PO Mains Syllabus 2019 PDF Download– We are here for you to provide you with the most comprehensive and detailed information about the SBI PO Mains Syllabus 2019. The SBI PO Main Exam Syllabus 2019 will give you a great idea of how to prepare for this recruitment exam. Furthermore, we have given in this article the SBI PO exam pattern and paper format. This will help you figure out the weightage of the SBI Exam subjects. Furthermore, we have also attached the SBI PO Mains Syllabus PDF here for you to download. This will help you prepare for the recruitment exam even when you are offline. All you have to do is download this SBI PO Exam Syllabus PDF and utilize it whenever you are offline as well. We have received all this information about the SBI PO Mains Syllabus from the official notification for probationary officer which was uploaded on the official website @ www.sbi.co.in. The SBI PO notification has been released and people all over the country are frantically applying for the posts of PO (Probationary officer). But the tough selection procedure is a big barrier between you and this high paying job. Fret not, because we have also given several tips and tricks to pass this exam at the end of this article. So, let us now move along with the article about the SBI Bank PO Mains Exam Syllabus. There will be negative marking for both the rounds of selection in the prelims round as well as the main examination. It will be 0.25 marks cut per the wrong answer. Current Affairs is something which you will have to increase by self-study. We suggest you start keeping par with the latest happenings around the globe with the help of newspapers and other media. We recommend that you skim through the yearbooks and magazines to be informed about the most important news across the country. The total marks of candidates qualifying in the objective and the descriptive tests will be arranged in descending order and then a group will be called for the group exercises. The qualifying marks will be decided by the authorities. Candidates who wish to exercise their OBC certificate must bring up their certificate without which they would not receive any concession. Marks scored in the prelims will not be counted in the final counting. The ratio between the main exam marks and the interview marks will be 80:20 respectively. The result of the qualified candidates will be available on the official site. How to Prepare for SBI PO Exam? Like we promised at the beginning of the article, we are here to provide some tips and tricks to crack this monstrous feat of an exam. So follow these tips and you will be sure to pass and secure a fabulous job at the State Bank of India. Download the syllabus and check out thoroughly the areas which you need to focus on. Try to make a schedule which you will religiously follow as you need to cover all the topics at least once before the exam. Focus on the areas which need more practice and try to practice them every day. If you are unable to cover everything before the exam commences, then try to focus on the subjects which have more marking. Don’t try to cover everything a few nights before. Answer Key SBI Bank PO Answer Key: Know your score! We hope you liked this article about SBI PO 2019 Mains syllabus. Also, comment down below if you have any doubts regarding this article or any other article and we will get back to you as soon as possible. If you want to check out other articles about upcoming govt jobs, subscribe to us by entering your email id and by bookmarking us to your favorite browser. We are the GovtJobIndia.com team and we will be here to help you with any requirements about the latest govt job notifications.